One of my favorite chicken smokes and a easy yet complex recipe. This recipe delivers multiple layers of flavor and textures. As far as smokers go this is one of the quicker meals to smoke. 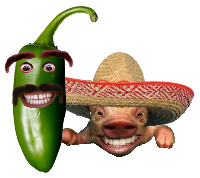 Smoke time is approximately 3 hours. Lets start by rinsing and cleaning the chicken breast. Next lay 2 slices of Black Forest ham overlapping 25% of the next slice. Cut Swiss cheese slice into 1/4 inch wide strips. Stack slices of Swiss at one end of the ham. Squirt a bead of Jack Daniels Honey Dijon mustard next to the Swiss cheese slices. Roll up the ham around the Swiss cheese. Do this 7 more times to make one ham & Swiss roll for each chicken breast. Using a small sharp knife cut a 2" opening in the large end of the chicken breast. Working the knife in a sawing motion cut a pocket in the inside of the chicken breast. Pour in 1/2 Tsp Zesty Italian dressing. Using your finger work it around the inside cavity. 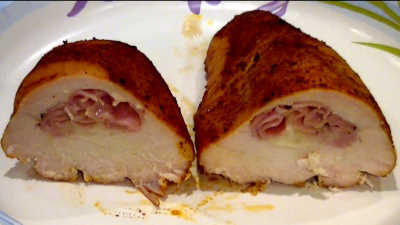 Take a ham & Swiss roll and insert it into the end of the chicken breast while twisting in the direction the ham is wrapped. This will allow it to be inserted into the cavity with little effort. If it does hang up just press it in with your finger. Be careful not to breach the outer layer of meat. Pinch close the opening as best possible. Do this for each of the 8 chicken breasts. Place Chicken breast in 1 gallon Ziploc bag and pour in 1/3 bottle of Zesty Italian dressing. Place in the refrigerator to marinate for 4 to 6 hours minimum. Once the chicken has marinated, remove from Ziploc bag but don't rinse. Lightly sprinkle on some garlic powder. Coat chicken breast with a fair dusting of Jacks Old South "Hickory" dry rub, top sides and bottom. Pre-heat smoker to 230 degrees. 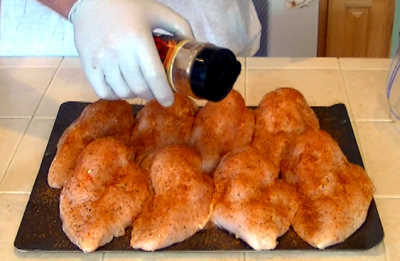 Place chicken breasts on smoker grate and smoke @ 230 degrees mopping once after 1 hour with Zesty Italian dressing. Smoke until the internal temperature reaches 168 degrees. Pull chicken, cover in foil and let stand for 20 minutes. Serve with smoked beans and cornbread. 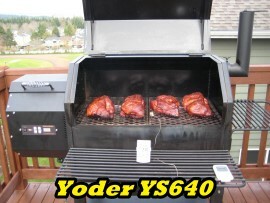 Nothing like taking a gourmet dish to the smoker!